The X-31 program differed from most prior NASA programs in its emphasis on military applications in flight. During flights with US and German service pilots, the X-31 aircraft was evaluated in a variety of simulated air combat roles, including air-to-air close combat, ground attack, military maneuvers and aircraft carrier operations. This airplane was capable of controlled flight at both angles of attack greater than 70 degrees and during post-stall conditions beyond the aerodynamic limits of any conventional aircraft. During dog fights with comparable but non-thrust-vectored aircraft, the X-31 maneuverability was clearly superior. Controllability at high alpha gave it almost a helicopter-like ability to put on the brakes, do an about-face and fire from within the opponent's turning radius. Two X-31A aircraft were built by Rockwell International, Downey, California (now part of Boeing) and Daimler-Benz Aerospace (DASA), Germany, in an international research program funded by the US Advanced Research Projects Agency (ARPA) and the German Federal Ministry of Defense (FMOD). This shaving was produced on May 26th, 1988, in a ceremony with the directors of the X-31 program, the president of Rockwell, and numerous managers. This display measures 18 inches in height, and 14 inches in width, mounted in heavy matting. 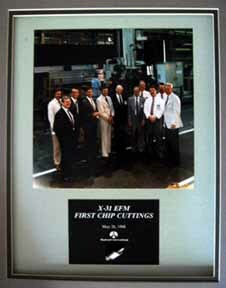 Of note, this chip was shaved from a piece for the first X-31, which crashed during flight testing on January 19th, 1995. Click here for more information on this crash. The Jetstream 41 is a turboprop-powered feederliner and regional airliner, originally designed by British Aerospace as a "stretched" version of the popular 19-seat Handley Page Jetstream 31. Intended to compete directly with 30-seat aircraft like the Embraer Brasilia, Dornier 328 and Saab 340, the new design eventually accommodated 29 passengers in a two by one arrangement like the Jetstream 31's. The stretch added 16 ft (4.88 m) to the fuselage, consisting of an 8 foot (2.5 m) plug forward of the wing and a 7 ft 9 in (2.36 m) plug to the rear. The additional weight demanded a wing with increased span, which also included reworked ailerons and flaps. The wing was also mounted lower on the fuselage so that it did not carry through the cabin aisle, which also led to larger wing root fairings that increased baggage capacity. The latest version of the Garrett engines, now owned by AlliedSignal, delivered 1,500 hp and were mounted in new nacelles with increased ground clearance. The flightdeck was improved with a modern EFIS setup, and a new windscreen arrangement. Development work on the J41 was announced in mid 1989, and the first J41 flew on 25 September 1991. Three further aircraft were also used in the flight test program, and the design was certified on 23 November 1992, with the first delivery to an end-user taking place two days later. BAe decided to "spin off" the Jetstream division in 1993, and "BAe" was dropped from the name of the aircraft. In January 1996 the J41 became part of the Aero International (Regional), a marketing consortium consisting of Aérospatiale (of France), Alenia (of Italy), and British Aerospace. Sales were fairly strong, but in May 1997 BAe announced that it was terminating J41 production, with 100 aircraft delivered. The J41 was initially known as the BAe Jetstream 41, but BAe's establishment of a separate Jetstream Aircraft division in mid 1993 saw the name simplified to just Jetstream 41. From January 1996 the J41 became part of the Aero International (Regional) stable, but in May 1997 BAe announced that it was terminating J41 production. As of August of 2006, 52 J41s were reported to still be in service. 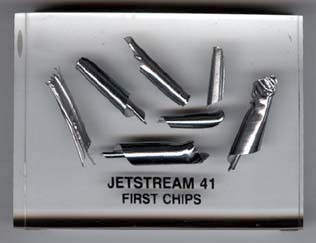 This lucite paperweight contains chips from the first piece milled for the J41. It is 3 inches tall, 4 inches wide, and an inch in thickness. Swatch of Interior Fabric from a (restored) Boeing 307 "Stratoliner"
The Model 307 Stratoliner was the world’s first high-altitude commercial transport and the first four-engine airliner in scheduled domestic service. With names like Rainbow, Comet, Flying Cloud and Apache, the Stratoliner set new standards for speed and comfort. Its pressurized cabin allowed the airplane to soar above rough weather at an altitude of 20,000 feet — higher than any other transport of its time. Its circular fuselage provided maximum space for the five crew members and 33 passengers. The nearly 12-foot-wide cabin had space for comfortable berths for overnight travelers. The Stratoliner was the first airplane to have a flight engineer as a member of the crew. The engineer was responsible for maintaining power settings, pressurization and other subsystems, leaving the pilot free to concentrate on other aspects of flying the aircraft. In 1940, the 307s started flying routes to Latin America and from New York to Los Angeles. Production stopped at the onset of war, and five were drafted into the Army Transport Command as C-75 military transports. The Clipper Flying Cloud, one of only ten Boeing 307 Stratoliners built and the sole remaining one, was delivered to Pan American World Airways in 1940 and designated Pan American 903. It was flown in Caribbean service for two years, when a one-way ticket aboard the luxuriously outfitted airplane cost $1,000 in 1940 dollars ($12,000 now). With the onset of World War II, 903 was put to work for the Army Air Transport Command, flying South American routes from 1942 until 1946, when it began to fly the daily round trip between Bermuda and New York. Eventually the plane had numerous owners, including Le Corps d’Aviation de l’Armée d’Haiti. Named the President’s Model, it was used as the personal airplane of “Papa Doc” Duvalier. The Smithsonian Institution acquired the aircraft in 1972. The Boeing Company offered to restore the Clipper Flying Cloud to its original and flightworthy condition in the early 1990s, a rebuilding effort that transpired in the same Seattle building where it was first built. After six years of painstaking work, concluding in June of 2001, dedicated Boeing technicians and former Pan Am employees completed the restoration of the world's only remaining Stratoliner. On March 28th, 2002, Clipper Flying Cloud was ditched in Elliot Bay near Seattle. The ditching was largely the result of inattention to the fuel gauges and poor assumptions by the four crew members. The Stratoliner was carefully hoisted from the water the following day, and on June 14th, Boeing announced that they intend to restore the Stratoliner, again, to flightworthy condition within a year. 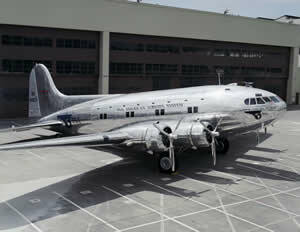 Boeing rolled out the restored Stratoliner on 13 June 2003. Pan American 903 is now a centerpiece exhibit in the Steven F. Udvar-Hazy Center of the National Air & Space Museum at Washington Dulles International Airport, outside Washington, D.C. The interior of the fuselage is covered in fabric specially woven for the craft, which has maps of the world with Pan Am’s logo. F. Schumacher & Co. of New York, N.Y., used a vintage loom to produce the original picturesque Pan Am wall fabric showing the Pan Am logo, world map and animals native to various continents. The fabric design was the same as that of the Boeing 314 Clipper and Boeing Archives fortunately had preserved some of the Clipper fabric. The color of the cloth was determined from remnants trapped between structures of the airplane. After the ditching, some of the interior fabric need replaced. This is a swatch of replaced fabric removed after the 2003 ditching. The F-22 Raptor is a stealth fighter aircraft. It was originally envisioned as an air superiority fighter for use against the air force of the Soviet Union, but is equipped for ground attack, electronic attack and signals intelligence roles as well. It is the most advanced fighter currently in service and Its combat performance is considered unrivalled according to the United Kingdom's Defence Evaluation and Research Agency fighter study. Long in development, the aircraft was also known as the prototype YF-22 and as the F/A-22 for three years before formally entering United States Air Force service in December 2005 as the F-22A. Lockheed Martin's Aeronautics division is the prime contractor and is responsible for majority of the airframe, weapon systems and final assembly on the F-22. Boeing's Integrated Defense Systems division provides the wings, aft fuselage and avionics integration. 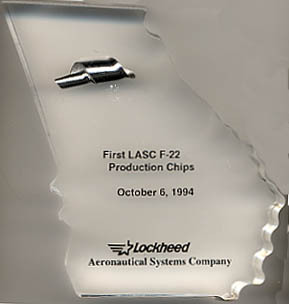 On October 6, 1994, Charles Wilkey, a milling machine operator with Lockheed Aeronautical Systems Company (LASC) of Marietta, Georgia, began fabrication of the first part LASC built for the first F-22 'Raptor'. The aluminum part is an engine inlet dust frame segment. From this milling process, the resulting shavings and chips were collected for promotional use. The chip in embedded in a lucite paperweight in the shape of the state of Georgia. The 'Delta Clipper Experimental' was constructed in 1991 and finished in 1993 at McDonnell Douglas' Huntington Beach facility. It was intended as a one-third scale model of a proposed SDIO single-stage launch vehicle. It first flew in August 1993 and had completed three flights when the Strategic Defense Initiative Organization (SDIO) terminated the Delta Clipper program. After additional funding was procured, the vehicle flew five more flights before being returned to Huntington Beach for conversion into the DC-XA. However, during the fifth flight of the program on June 27, 1994, an external detonation of fuel cloud vapors caused by the ground support equipment damaged the DC-X. Despite a 4 by 15 - foot vertical tear in the vehicle's aeroshell during takeoff, the 42-foot-high DC-X successfully executed a controlled emergency landing on the desert floor. Nearly a year later, the DC-X reached an altitude of 4,350 feet flying at a constant angle. During the ascent, the DC-X traveled 1,150 feet from the flight stand. The vehicle traveled laterally until it was positioned over its landing pad located 350 feet from the initial flight stand. The DC-X touched down approximately 123.6 seconds after liftoff. Produced by the United States Air Force / Phillips Laboratories, and McDonnell Douglas Aerospace, this letter of appreciation carries the facsimile signatures of both the program flight manager, former astronaut Charles "Pete" Conrad, as deputy director for flight test, Air Force Captain Dale Shell. 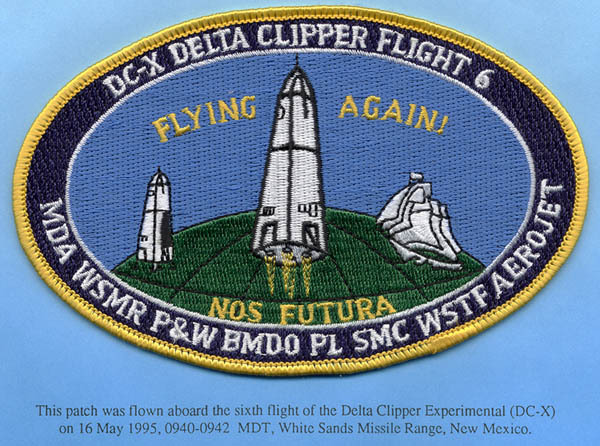 The patch celebrates the DC-X's return to flight after it's near loss. However, it's ultimate fate was only averted slightly. After the DC-X program was completed, the prototype was converted into the DC-XA. It was destroyed during its fourth flight as the DC-XA on July 31, 1997. Landing strut #2 failed to extend, causing the unbalanced vehicle to tip over on its landing pad. The LOX tank exploded and there were indications of secondary explosions in the LH2 tank as well. The ensuing fire damaged large sections of the DC-XA. An investigation board was convened to determine the cause of the accident, which was later determined to be an unconnected helium pressure line that supplied hydraulic pressure to extend the landing strut. 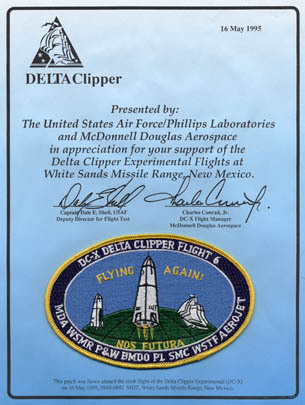 Patch Flown on the Second and Third Flight of the McDonnell-Douglas DC-XA "Clipper Graham"
The Delta Clipper Experimental Advanced (DC-XA) is a modified version of the DC-X. The DC-XA is operated by NASA and the Department of Defense under the Reusable Launch Vehicle program. It had a lightweight graphite-epoxy liquid hydrogen tank and an advanced graphite/aluminum honeycomb inter-tank built by McDonnell Douglas; an aluminum-lithium liquid oxygen tank built by Energia; and an improved reaction control system, made from composite fuel lines, joints, and valves, from Aerojet. These improvements reduced dry vehicle mass by 620 kilograms. The flight vehicle was tested at White Sands during the summer of 1996. On it's second flight, the "Clipper Graham" climbed vertically at 170 feet per second to an altitude of approximately 590 meters, then flew laterally for 180 meters up range before throttling back its engines and descending tail first onto the desert floor. Duration of the flight was 63.6 seconds. The flight also tested the differential global positioning system (DGPS) that provided positional data to the Clipper Graham's navigational system. Signals from satellites of the Global Positioning System and a ground station were used to precisely determine the position of the reusable rocket. The second DC-XA test flight which was dedicated to the memory of Lt. General Daniel O. Graham. At the conclusion of the flight, NASA Administrator Daniel S. Goldin announced that the DC-XA vehicle has officially been renamed "Clipper Graham" on honor of the late General who passed away in December 31st, 1995 of cancer. Graham had supported the development of single-stage to orbit (SSTO) spacecraft while serving in the Air Force. "Clipper" comes from the original name of the vehicle, the "Delta Clipper." The third flight lasted 142 seconds, and climbed to an altitude of 3,140 meters, setting a new altitude and duration record for the program. It also demonstrated a 26-hour turnaround between its second and third flights, a first for any rocket. The "Clipper Graham" was destroyed during its fourth flight as the DC-XA on July 31, 1997. Landing strut # 2 failed to extend, causing the unbalanced vehicle to tip over on its landing pad. The LOX tank exploded and there were indications of secondary explosions in the LH2 tank as well. The ensuing fire damaged large sections of the DC-XA. An investigation board was convened to determine the cause of the accident, which was later determined to be an unconnected helium pressure line that supplied hydraulic pressure to extend the landing strut. The patch contains an imprinted clear decal on its underside that says, "This patch flew aboard the Clipper Graham 7 June 1996 at 10:15 MDT 8 June 1996 at 12:17 MDT". The front of the patch, stitched in deep shades of red, white, and blue with a gold color edging, says around the rim "Dedicated to the Memory of Lt. General Daniel O. Graham". In the center is an X and the white sails of a clipper ship superimposed against a blue globe representing the Earth. Click here to see the video of the crash!